About 6 months ago, I decided that the money to run our second car, costing over $AU1500 per year, might be better spent elsewhere. Somehow I came across the idea of converting an existing bike into an eBike by just adding a few components (see some good communities that can help you get started at the end of this article). 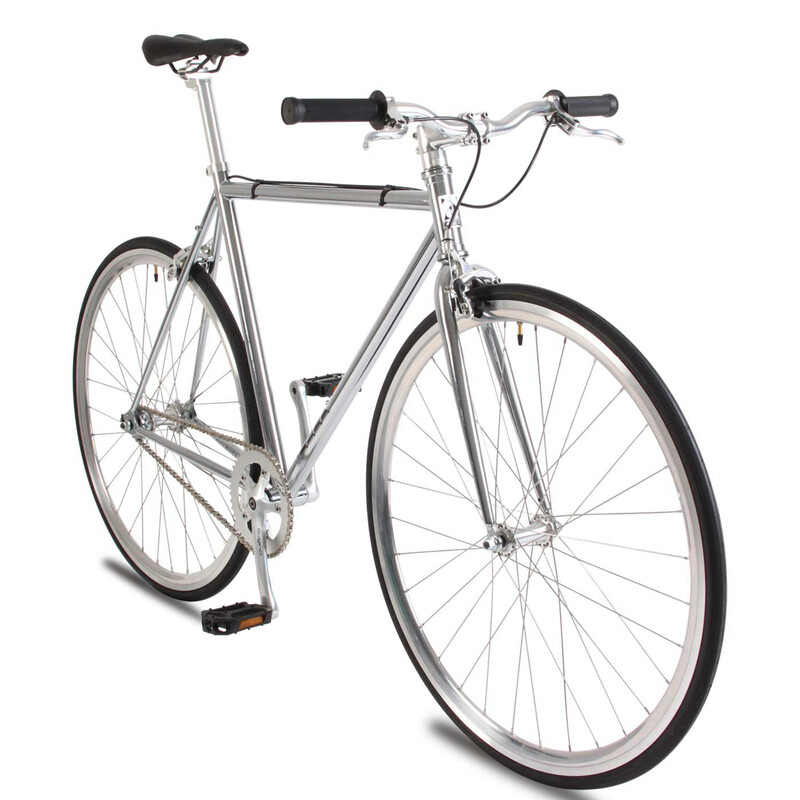 The initial outlay was going to be about $600 (due to a free fixed gear bike from my brother, thanks John!) which is less than half the $1500 per year to run the car, so theoretically after 6 months, I’ve made my money back. My main use would be to commute to and from work, which would normally leave me sweaty and stuffed by the time I get there (ok, it’s only 5Km (3.1 Miles) but hey there are a lot of hills :)), and the idea/appeal of the eBike is that you can gently pedal and the motor does the rest. (You can see my comparison of a real bike vs eBike on this 5KM route below). 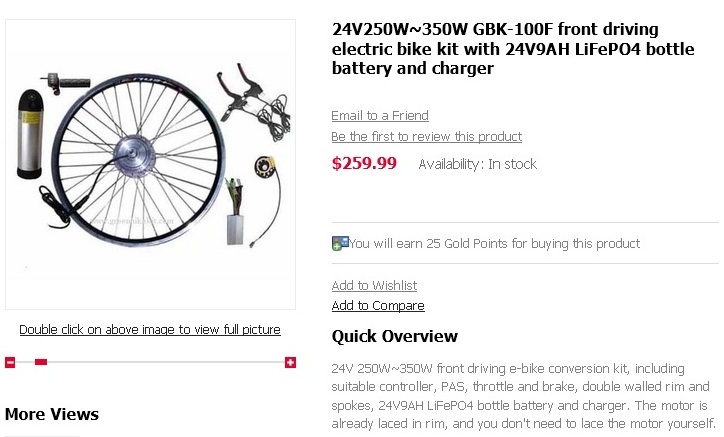 After a bit of research, I ended up with a front wheel hub system, pictured below, 250W-350W from http://www.greenbikekit.com/ with a 10Ah bottle battery. This is not a specific plug for this website but the price seemed pretty good and I can attest that everything came as expected, except the packaging was totally stuffed, probably due to customs but I’m not sure, but it was all in-tact and arrived within about 8 working days from ordering. This came with battery, controller, front wheel, everything needed to convert an existing bike to an eBike, apart from tire, tube and zip ties, which I already had or took off the existing wheel. Not much to it, pretty clean, light and unencumbered. Zip ties are very important in any eBike build for holding cables mostly, so make sure you have some handy when converting yours! The install time was probably around 1 Hour all up to install the kit and put everything together. I chose a front wheel hub system because I wanted the least amount of complication for my first eBike build and aside from something like the Copenhagen Wheel or FlyKly (neither of which at the writing of this article are officially out yet), this was the closest thing on the market to simplicity. The whole system was designed for plug and play basically. I’m not really handy with this kind of stuff but it all came together in a straight forward way. It’s certainly a lot easier to convert them these days than it used to be. The brakes I’ve kept as standard pad brakes which haven’t caused me any issues. I’ve read that you have to use disc brakes with an eBike but I haven’t found that to be the case. Of course stopping would be easier but just give yourself room and don’t ride full pelt up to a corner of traffic and you will be fine. The single gear part means that I can’t change gears at all, so on the flat, after about 30km/h (20Miles/h) I couldn’t pedal if I wanted to because I have no gears and it is fairly highly geared. So as soon as I reach about the 30KM/h speed, I can’t go any faster unless going downhill. I’m ok with this and it probably saves a bit of battery having to just cruise at that speed. In terms of performance, it’s a breeze to ride and just cruises to work on the 5KM (3.1 Miles) route. I’ve found a route that is fairly flat since I’m looking for comfort more than speed. Choosing a less direct route adds about 2 minutes to my time resulting in a 12 minute ride. I expect after a few months to shave 2-5 minutes off my journey. In terms of how far this will go on one charge, I can do a 20KM (12 Mile) ride without much trouble and have managed a 30KM (20 Mile) ride as well and it’s a blast to be able to ride that far unencumbered and if you can’t be bothered peddling just rely on the throttle to keep you going. If you are planning your own eBike build, and your in southern Adelaide your better off getting a standard road or mountain bike and using the kit above to convert that. In Adelaide Southern Suburbs, there is no one selling eBikes from any store yet, but I’m sure that will change. At the moment, you would have to go up north or go online to get pre-built. The advantage of building yourself instead of buying pre-built is it is easier to fix if something goes wrong, if the controller dies, you can just buy a new one. if the controller dies in an all-in-one specialised eBike, you would have to most likely go back to the shop. Add that on to the >$1500 for a specialised eBike and I think I made a good choice. If i were to buy my bike, I think it would be in the order of $300-$400 second hand. So the whole eBike build would be <$1000 including bike. The only other recommendation I have is to invest in good tires! Initially I had the stock tires which weren’t that good and I got a few frustrating flats. I’ve now bought top of the line tires to guard against flats and good thick inner tubes as well. Something like these which i have on my front rim. To be able to ride freely and easily past other riders, and have the confidence that the bike can do some of the work if you get tired, that’s an excellent feeling. To be able to get to work without sweating and also be getting exercise is a small but nice freedom and not having to pay rego, insurance, petrol and be doing something small for the environment whilst encouraging others to do the same is also really nice. It’s also fun to find hidden roads, pathways and tracks to use to avoid the traffic. Will I be wanting more speed, pushing the distance barrier? Probably, but I’m happy for now at 30-40KM distance and the speed and acceleration that I have. Speed comparison with an expensive mountain bike. I borrowed my brothers expensive mountain bike (~$2000) for a test ride and managed to get 19KM/h (11Mp/h) on average over a 5KM distance. This is in comparison to the 25KM/h (16M/h) I get with the eBike, and I was sweating like crazy when I go to work. I also tried my cheap (~$200) mountain bike and had a similar experience, it was a bit harder to ride and I lost 1KM/h compared to my brothers expensive bike. So here is the breakdown. So that’s all for now, I hope this has been informative. I’ll give a plug for the Endless Sphere forums and the reddit eBike community which have been helpful. As always, stay safe and get ready to discover your community environment one bike ride at a time!